Visualisation is a key when you need to keep control of what’s happening on networks which carry daily tons of malicious files. virustotal.com is a key player in fighting malwares on a daily basis. Not only, you can submit and search for samples on their website but they also provide an API to integrate virustotal.com in your software or scripts. A few days ago, Didiers Stevens posted some SANS ISC diaries about the Integration of VirusTotal into Microsoft sysinternal tools (here, here and here). The most common API call is to query the database for a hash. If the file was already submitted by someone else and successfilly scanned, you’ll get back interesting results, the most known being the file score in the form “x/y”. The goal of my setup is to integrate virustotal.com within my ELK setup. To feed virustotal, hashes of interesting files must be computed. 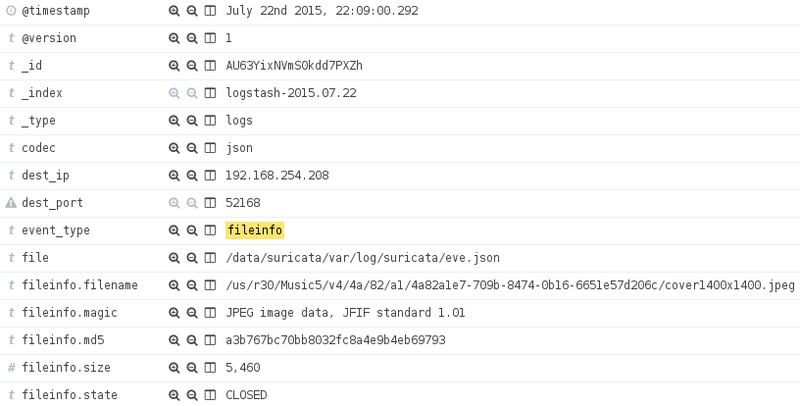 I’m getting interesting hashes via my Suricata IDS which inspect all the Internet traffic passing through my network. Note: It is mandatory to configure Suricata properly to extract files from network flows. Otherwise, the MD5 hashes won’t be correct. It’s like using a snaplen of ‘0’ with tcpdump. In Suricata, have a look at the inspected response body size for HTTP requests and the stream reassembly depth. This could also have an impact on performances, fine tune them to match your network behavior. Now, create a new filter which will call the plugin and restart Logstash. Now, it’s up to you to build your ElasticSearch queries and dashboard to detect suspicious activities in your network. During the implementation, I detected that too many requests sent in parallel to virustotal.com might freeze my Logstash (mine is 1.5.1). Also, keep an eye on your API key consumption to not break your request rate or daily/monthly quota.